Grandma's Maple-Glazed Apples & Hot Dogs: A Recipe Passed Down Through the Generations | Mealtime | Kids VT - small people, big ideas! When my parents were first married, they lived in Oklahoma and Texas. But nothing felt like home except Vermont, where my father had lived for several years as a child, and where my mother had lived since her early teens. They made the decision to move back north for good when I was about a year old. My mother's father had passed away, and my grandmother was living in my mother's childhood home in South Hero with ample room, so that's where we went. I often think of my grandmother, accustomed to living alone, more or less, suddenly faced with her daughter's gaggle of four young children, disrupting her peaceful life in the woods. Then I remember that my grandmother had five younger brothers and realize it probably wasn't that disruptive after all. Growing up in a multigenerational home had its benefits. One of those was learning some of Grandma's recipes. She wasn't as adventurous in the kitchen as my father and mother, but she taught us all a lot. My sister remembers learning how to make scrambled eggs by Grandma's side. After she caught me trying to bake dollops of peanut butter with a carrot stick in the middle of each when I was 5 years old, Grandma taught me how to make real cookies, using a recipe as a guide. But perhaps the most memorable dish she taught all of us to make was her maple-glazed apples and hot dogs. Grandma came up with this recipe when my mother was young, after they had moved to Vermont from Pennsylvania. I think all of us kids cook it now. It's quick, comforting and oh-so-Vermont. I recommend using quality hot dogs or even a good kielbasa. And perhaps it goes without saying, but if you aren't going to use real maple syrup, don't bother with this recipe. 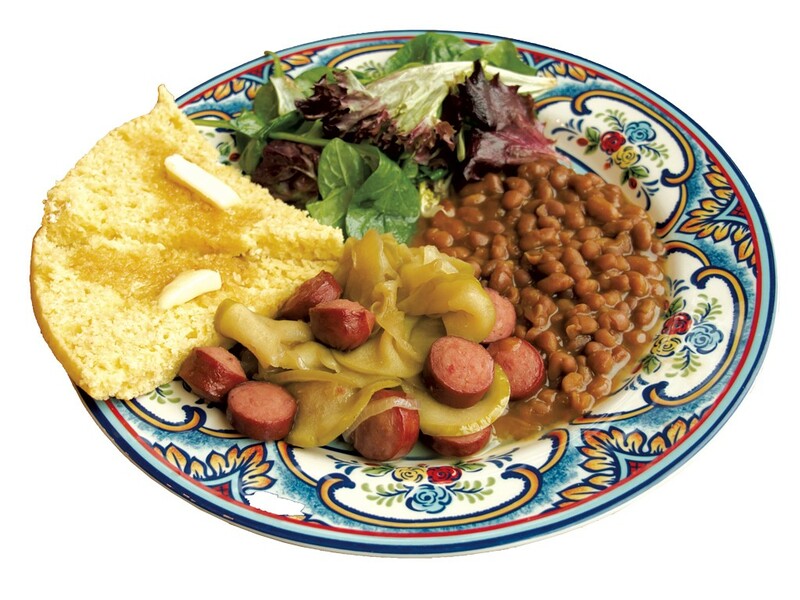 The dish is wonderful served with baked beans and fresh corn bread drizzled with butter and honey. I hope that it becomes a family favorite in your house, too. Melt 1 tablespoon butter in a skillet over medium heat, and sauté the onions until soft and translucent, about five minutes. Add the other tablespoon of butter. Stir together the maple syrup and mustard, then add to the pan. 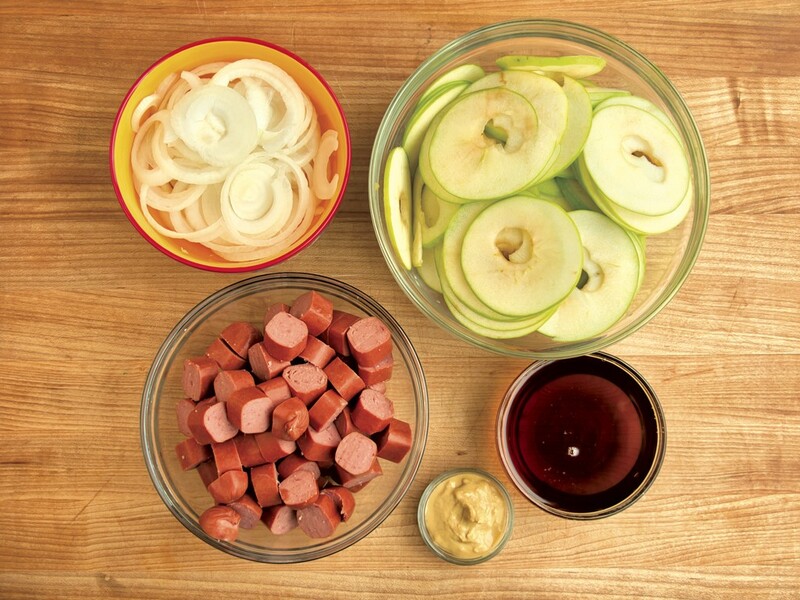 Put the apples and hot dogs into the pan and stir to coat. Cover the pan and simmer over low heat, stirring occasionally, until the apples are soft — about 10 to 15 minutes. Serve and enjoy, preferably with corn bread and baked beans.